11 Comments on "Cuff, No Break by Billax"
To me, the ideal is the length on his left leg; the right looks a little too long, I guess because of how he’s standing. A good rule of thumb for this look is a slight break, long enough to cover the socks when walking, but not long enough to puddle. Regarding cuffs, Maxminimus preaches 2″ cuffs. I had a suit finished that way last year for the first time, and I don’t think I’ll ever go back. Like I said, I’m sure I’m not going to change your mind on break, but I strongly urge you to consider 1 3/4″ or even 2″ cuffs. If you really hate them, you can always have them redone. These skimpy cuffs remind me of the cuffs that come on the factory inseam on cheap pants. I used to not believe in the idea of a “sartorial icon”, but Billax is absolutely one of them for me. No one I’ve seen blends comfort with style to such a degree. Such a gentleman. Perhaps this was more obvious to others, but I have found through my own experience what really makes or breaks (no pun intended) the “cuff, no break” look is how wide the leg opening is at the bottom of the pants. If the opening is too large, the proportions really get thrown off (which I would venture to say is what’s happening in the image above with the pinstripes and wholecuts). You make an interesting point, Trip. For dress suits (city rather than country suits) I use an 18″ leg opening, so as to cover the laces of Balmorals and Bluchers (and in the case you mention, Wholecuts). All others are narrower, with madras, poplins, chinos, and khakis having the narrowest leg opening, at 15-16″. For country suits and odd trousers, my leg opening is tapered to 16-17″. I think the opening/break on those two middle tweed trousers is spot on. They look great. 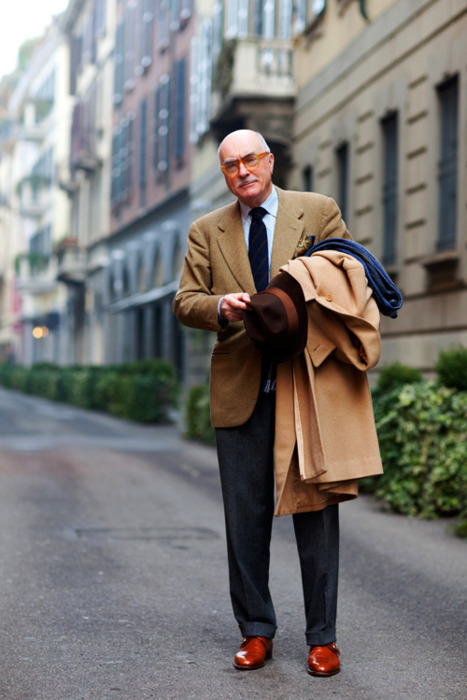 “Billax is the master of the “cuff, no break” I’ve been dressing Ivy League/Trad for 50 years but it’s only since I have seen Billax’ example that I have been inspired to get the no break just right. 2″ cuff no break. Wore it in the 60’s still wearing it today. Billax is our guiding light. They’re a tad short for my liking, but you guys wear it as well as anyone can. For me, too, the trousers are just a tad short, but I also heartily concur that Billax looks great! I love the combination of colors and textures, and the last picture? Perfection. Billax is a man of impeccable style and taste.